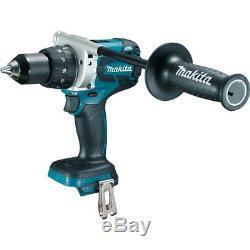 Makita XFD07Z 18-Volt 1/2-Inch Lithium Ion Cordless Driver Drill - Bare Tool. Of torque for the most demanding drilling and driving applications. It's powered by a Makita brushless motor for longer run time, increased power and speed, and longer tool life. The XPH07Z is positioned at the top of Makitas deep line-up of driver-drills, and is a workhorse tool engineered with durability features for operation in harsh job site conditions. Its part of Makitas expanding 18V Lithium-Ion series, the worlds largest cordless tool line-up powered by an 18V Lithium-Ion slide-style battery. Makita 18V Lithium-Ion batteries have the fastest charge times in their categories, so they spend more time working and less time sitting on the charger. BL Brushless Motor delivers 1,090 in. The electronically-controlled BL Brushless Motor efficiently uses energy to match torque and RPM to the changing demands of the application. All metal variable 2-speed transmission (0-550 and 0-2,100 RPM) for a wide range of drilling, fastening and hammer drilling applications. All metal gears and gear housing for maximum job site durability. All metal 1/2 self ratcheting chuck for improved bit gripping strength and durability. Compact and ergonomic design at only 8-1/8 long. Weighs only 5.8 lbs. With battery (battery not included) for reduced operator fatigue. Gauge indicates battery charge level. Extreme Protection Technology (XPT) is engineered for improved dust and water resistance for operation in harsh conditions. Lights illuminate the work area. Rubberized soft grip provides increased operator comfort. What's in The Box. 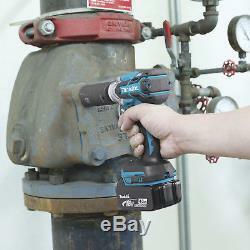 18-Volt 1/2-Inch Brushless Driver-Drill - Bare Tool. 0 - 550 / 0 - 2,100 Rpm. SECURE & HASSLE FREE SHOPPING. All our sales are backed by a 30-Day Satisfaction Guarantee. Products shown as available are normally stocked but inventory levels cannot be guaranteed. The item "Makita XFD07Z 18-Volt 1/2-Inch Lithium Ion Cordless Driver Drill Bare Tool" is in sale since Tuesday, May 24, 2016. This item is in the category "Home & Garden\Tools\Power Tools\Cordless Drills".